I'm not one to complain about an excess of broad beans, but I had some still sitting in the fridge left over from earlier in the week. Rather than let them spoil, I decided to put them to good use. When it comes to risotto, I'm usually a big fan of a lovely, creamy mushroom risotto and as a result rarely make anything else. Here though, I wanted something which would make the most of the broad beans, and also be relatively healthy, which this is. This makes 6 servings and each serving has less than 350 calories in it. The trick is frying the onions in the fat from the lardons, which not only adds to the flavour, but means you don't have to add any additional fat to the recipe. Finely slice the onion, then in a large frying pan, fry the lardons until they start to run fat. Add the onions and fry until golden, then crush in the garlic and add the risotto rice. Fry for a minute, until the rice becomes slightly translucent, then add about a third of the chicken stock, the herbes de Provence and stir thoroughly. Cook over a low heat. Season with pepper if you like at this point. When most of the stock has been absorbed, add a little more and stir again. 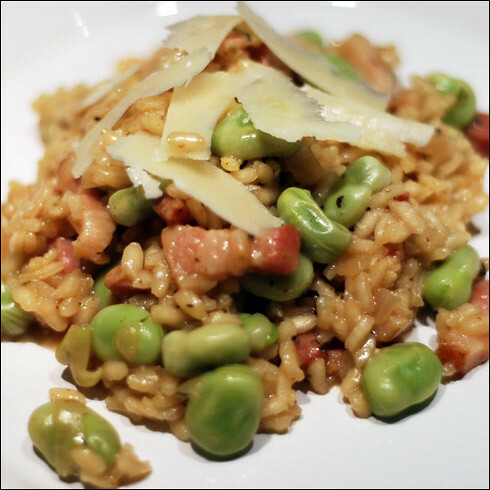 When you have about 200ml left to add to the risotto, add both the liquid and the broad beans, stir well and simmer until you have a thick, slightly soupy risotto. Taste the rice at this point - it should be soft, but slightly al-dente. If it's still quite hard, add a little more water and simmer it down for a further 5 minutes or son. Once cooked, stir in 50g of grated parmesan, then dish up onto plates. I added a few shavings of parmesan on top to garnish. OH YUMMY, Colorful recipe really i want eat its recipe . Great idea for food and interesting your recently post. When I was little I did not like rise! Imagine that, now I looooove rice. Especially risotto. I also love to experiment with different kind of ingredients. This looks very interesting. You have a lovely foodblog!